West Ham United full-back Pablo Zabaleta admitted that Manchester United are ‘easy to play against’ days after they lost 3-1 at the Olympic Stadium. 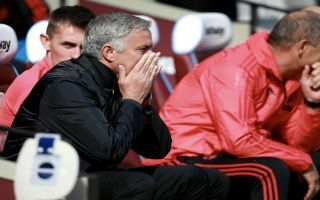 Jose Mourinho’s men succumbed to their third defeat in seven Premier League matches this term against the Hammers on Saturday, which saw them fall nine points behind Manchester City and Liverpool at the top of the table. The Red Devils were ineffective going forward and far too slow in their build-up play throughout the contest, despite the plethora of talented players on the pitch and on the bench. The Portuguese boss doesn’t seem to be able to get the best out of his charges at the moment and with the tough fixtures scheduled to pile up in the coming weeks, his position at Old Trafford looks precarious, to say the least. According to the Daily Star, Zabaleta has added fuel to the fire of United’s crisis in an interview on Tuesday, revealing that he feels ‘sad’ to see the club struggling as they are at the moment, as he told reporters: “You don’t expect a game to be that easy when you play against a top side. “I didn’t see any desire, passion, determination from Man United players. It’s sad to see really.”United are in Champions League action tonight against Valencia at Old Trafford, which is surely made or break for Mourinho if he is to survive as the club’s manager for the foreseeable future.Another home clash against Newcastle in the Premier League follows on Saturday, which will see the 13-time champions face Rafa Benitez’s struggling Magpies, who have yet to win a game in the 2018-19 campaign. If United fail to win both games then the players and manager will continue to fall under the spotlight and the club’s season will be almost in ruins, but equally, two consecutive wins could serve to lift the mood and get the team back on track in their hunt for silverware.